In addition to the important items on the list (club name, etc.) I would like to propose that we have some type of formula for our meetings...nothing too formal...just some key points we might all benefit from. I thoroughly enjoyed the "exposure through experience" from tasting the diacetyl-laden imperial brown at the first meeting. Weird as it may seem, I look forward to more "off flavor" beer tasting. So, my proposal is a segment of the meeting entitled "Adventures in off-flavors". I think it a good "buffer/learning curve" for most of us novice brewers, that wouldn't recognize specific off flavors if they smacked us in the face. In fact, I have an IPA that is exhibiting quite a bit of wet cardboard aroma, but I'm not sure if it's oxidized, or if its due to the fact that I dryhopped with 2 ounces of 2008 harvest Czech saaz, but I'm more than willing to pass some around and hear some thoughts/opinions/gags. And I may have one bomber left of an extremely astringent second-running stout, so we can all be reminded of the evil of tannins. Hell, we could even have a "worst beer of the year" contest if we felt so inclined to keeping tabs. 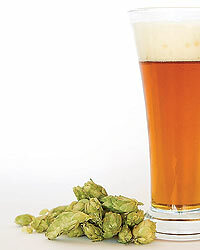 We could award the winner some nice cheesy aged hops...I have a half ounce of cascades from 2005 sitting in my drawer waiting for someone. Any other recommendations for topics/bullet points?